The railway line that had to communicate Lleida's city with Saint - Girons in the French Ariège remained to way to do, in La Pobla de Segur. This railroad had to turn also partly of an ambitious prolongation into south direction towards Teruel and the Andalusian region of Baeza. This longest railroad had overcome 850 km. of tour. Nevertheless the different epochs in which the project appeared it suffered the political and economic delays of finals of the 19th century and the convulsions of the current century. The railroad would think up for the river Noguera – Pallaresa and for the Salat. Competing with this railroad those of the Canfranc were constructed in Aragon and that of Puigcerdá in the oriental pirineos. It seemed to be logical that this railroad was losing support and state budgets in his construction. 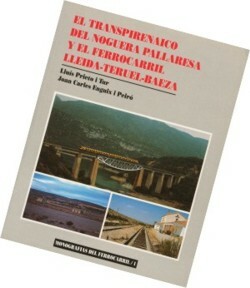 Other projects of secondary railroads from Lleida up to the French border taking advantage of the valleys of other rivers also they occupy his space in the book. Both dictatorial governments of Spain, Primo de Ribera and Franco, favored the construction of big public works and railway lines as the Saint - Girons to Baeza. The investments realized only have served for 89 km Between Lleida and La Pobla de Segur, which nonetheless is a fundamental way for the development and the communications of these regions, in danger of demographic and economic regression. The rest of the tracing up to Baeza is characterized by the left and ruined works along the whole distance. Even between Albacete and Baeza investments were done in the 60s taking advantage of the released economic stability, but to a little time the ambition frustrated and paralyzed. The only trains that have circulated along the line are those of placement of the route in the 60 and of his felling in the 90. There suppose the authors that it has been a great political nonsense the work of the AVE attacked Madrid - Seville and to stop to way to do this railway relation between the Levant and Andalusia. The authors hope that the work at least illuminates some dark and unknown aspects of the Saint - Girons to Baeza, undoubtedly one of the major failures in the construction of public works in Spain. Authors: Lluís Prieto, Joan Carles Enguix. Size: 19 X 24 X 1,5 cm.